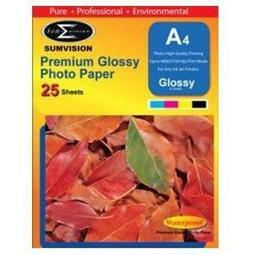 Glossy PrintPro photo paper for everyday inkjet and laser printing has a smooth, glossy surface. Because of its cardboard base and moderate level of gloss, this paper is suitable for the printing photos and graphics, both on inkjet and laser printers. When printing pigment ink is recommended to dry print to prevent blurring from the surface. Paper does not contain any harmful chemicals. Pictures should be stored in photo albums or picture frames to maintain quality.